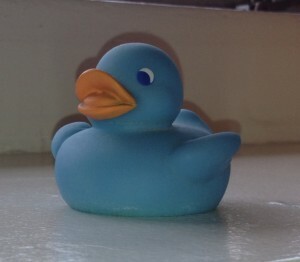 One of the classic baby toys is the rubber ducky. Babies love them. Why? Maybe babies like them so much because of their adorable face, or their small size is easy to manipulate with just one hand, and they float on top of the water. These 2 inch long toys are easy to hold in one hand and chew on. The wind-up bath toys have parts that may break off, are very heavy, and baby can not learn to manipulate them on her own. Developmental toys such as the rubber duck invite the participation of the child in creating the activity. Bring the rubber ducky to infant swim lessons. It provides baby with a simple way to entertain herself when she is waiting for her lesson or resting during the lesson. This is one of the best pool toys for baby because it floats, is easy for her to hold, and can be put in her mouth. If you have two or three different colors or styles it is beneficial for the swim time. They float on the water near her as she learns to paddle with her arm. Then you pick her up to rest while handing her the duck. These adorable rubber ducks come in different colors and even different costumes which make for fun baby gifts. These simple and inexpensive bath toys make great stocking stuffers for babies and can be tied on to the top of a baby shower gift in place of a bow. Swimming pools offering infant swimming lessons often have quite a stock of these animals. The variety include the cowboy rubber duck, mermaid rubber duck, firefighter rubber duck, and the princess rubber duck. Visit Partypalooza.com for pages of variations on these two inch bath toys. A unique baby shower gift would be a collection of six different ducks. This is one gift where moms are happy to receive more than one! Autumn is here, the kids have returned to school, and yet the Southen California warm sun continues to shine. What better time for baby swim lessons? The weather is beautiful and the pools are not as crowded! In the above video, Madison’s teacher introduces her to the floaties. 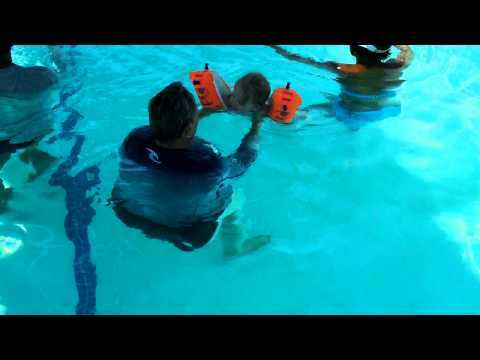 With the floaties on she practices kicking, one of the first motor skills for swimming. Very closely watch her legs at the very beginning of the video. This is Madison’s fifth lesson, and she is not quite nine months old. The first few lessons focus on getting her comfortable in the water and introducing the kicking and paddling. We will follow her progress in future posts. The above video was filmed at the Beverlywood , offering adult, children, and infant swim lessons. In our post about baby swim lessons, we discussed the technique of Jen Loven. Jen was famous for her infant swim technique, although her school closed. The Beverlywood Swim School was started by Crystal Scarborough, Jen Loven’s sister. Today their instruction continues the successful technique developed by Crystal and Jen. Some of my adult fitness clients took their children to swim lessons at Beverlywood as much as 20 years ago. I have been told, “It’s the ONLY place in LA to learn to swim!” An afternoon at the pool is absolutely wonderful baby play. There is so much for her to see and to explore. One observation I have made is that upon arrival at the school, Madison gives very big smiles! She curiously watches the swimmers. After swimming, she is very energized, happy and, of course, hungry! P.S. Don’t forget to pack some baby food! NOTE: Stellar Caterpillar is not paid in any way to promote Beverlywood Swim School. We simply want to share outstanding local infant resources with Los Angeles readers.